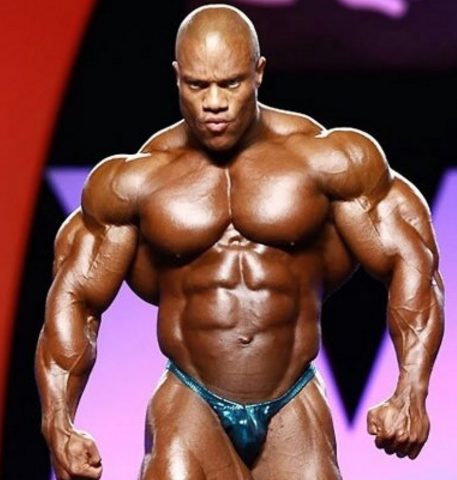 "Kevin Levrone Has No Chance Against Phil Heath"
Phil Heath just happens to be one of the most “gifted” athletes to ever step on the Olympia stage. Before entering the world of bodybuilding, Phil was a shooting guard where basketball helped put him through college. It wasn’t until 2002 that he took his talents to the stage and is now the top bodybuilder in the world. With so many competitors coming out of the woodwork, does Phil need to be worried about losing his title at the 2016 Mr. Olympia contest? Not a chance—at least in my opinion. Even Phil, himself, is laughing at how much attention the return of Kevin Levrone has on his chances of winning his 6th Sandow this year. While Kevin isn’t a real concern of Phil’s, he jokes that people need to be talking to Dexter, Ramy, Shawn, and some of the others fighting to place in the top 5 and 10—Kevin is no match for Phil. While all the hype is in place to have a showdown of old school versus new school, it will never come down to Kevin and Phil placing 1 and 2. It’s not like the Ronnie Coleman of old is making a comeback or Jay Cutler is coming back to jump on the stage one last time to see what he has left in the tank. So who has at least somewhat of a chance if Phil doesn’t come in spot on? Dexter and Shawn seem to have the closest chance of dethroning the current champ. If Phil leaves the door open, which I don’t think will happen, it’s either one of their titles to lose. Sure, you could throw Cedric in the mix, but honestly, it doesn’t seem like the look the judges are going for. Lately it has been the mass freaks that come in conditioned (or somewhat conditioned if you can read between the lines). If Kai Greene wasn’t such a buffoon, it’s my belief with the look he brought to the Arnold stages this year that he had a legit shot at taking the O title. However, with politics playing into the sport and the odds against Kai based on his past, I still believe even if Kai came in spot on, they still wouldn’t give him the Sandow trophy—but not to worry, Kai bowed out of this year’s O yet again. This touches on a previous article I wrote where I spoke about how the sport of bodybuilding needs transparency. Fans are left in the dark, not knowing the scores unless they do some searching on the internet after the show has ended. Every other sport you can follow along with a point/scoring system. Back on topic now that things went sideways a little. You have up and comers like Justin Compton and Dallas McCarver but both will be fighting for a top 10 placing in my opinion (not inside the top 5). Then you have Big Ramy who could come into the O as a wildcard. Everyone knows that he is capable of dwarfing everyone on stage, but his conditioning just never seemed to allow him to place where he thought he deserved to be. With Ramy working with Aceto on this prep, he has a chance to come in and push Shawn and Dexter out of the way and stand toe to toe with Phil. Will it happen? We will have to wait and see. But as it stands right now, if Phil comes in at his best, he will tie Dorian Yates with 6 Olympia titles—making it Phil’s 6th consecutive win at the show (2011-2016). It's mainstream and safe saying heath will beat leverone. The thing is though heath has gone backwards in recent years. This year's attention on the I will hopefully stimulate him. Since Kevin looks nowhere near this size and conditioning he is not going cause any damage. It just a good publicity stunt and great entertainment for all the fans. I sure will be watching him on the stage.